Stay young and live Life to the full, no matter how old you are. It means being alive, and living your Life like it! It means exploring the world and stretching yourself to do, learn, and experience new things, and becoming a multifaceted person like the Renaissance men and women of old. It means maximizing your Life experiences, learning, sharing, contributing, and breaking stereotypes about what it means to near 35, or even past it! In evangelizing this message to family and friends, clients and strangers, I focus on two key areas, reflected accordingly in AA35’s two main sections. To truly enjoy Life, you need a foundation, and that foundation is HEALTH and FITNESS. No matter how old you may think you are, it’s never too late to take charge of your habits so you can stay healthy. And no matter how young you may be, it’s never too early to start! Exercise is one of the most potent elixirs of youth, and this section has articles on why, how to get started, and ways to stay fit. 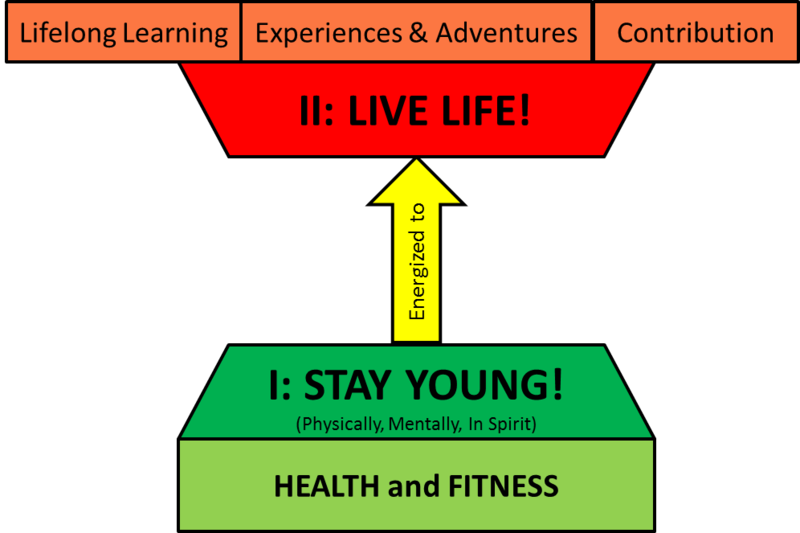 I also share ideas on the mental and psychological aspects of staying young. We may be alive, but are we really living? Living Life is not just staying alive in a routinized fashion, working and breathing like an automaton. It’s about being ALIVE, appreciating and partaking in what Life has to give, and developing ourselves into well-rounded, multi-facetted beings. All of us have dreams about what we’d like to do, experience, learn. How many of those have we actually achieved? In this section I will share ideas, activities and experiences on keeping engaged, self-improvement, lifelong learning, and expanding thoughts and experiences. In Life, we have to put in what we want to get out. That means changes. Changes in mindset, improvements in attitude, and commitment to a healthier and more empowering LIFESTYLE. Healthier bodies and mindsets will let you engage in meaningful, exciting and liberating activities in Life. You will gain new experiences and develop in ways that enrich your Life and those of the people around you. This blog can start you off.